The gallery ushers in 2018 with a stunning new portrait exhibition, Near To You. On view will be painting and sculpture by six exciting artists committed to the language and texture of paint and painting as well as challenging approaches to portraiture itself. What does it mean to capture the impression or image of a person? What is it that the viewer recognizes in a portrait? The exhibition will be on view January 19 – March 24, with an opening reception on Friday, January 19, from 6:30 – 8:00 pm. A catalog will be published to accompany the exhibition. Near To You features the work of Tim Doud, Jenny Dubnau, Donna Festa, John Mitchell, Heather Morgan, and Julia Schwartz and includes self-portraits and portrait subjects. Two of the artists, Dubnau and Festa, are 2017 Alexander Rutsch Painting Award finalists. The exhibition title is inspired by Nina Simone’s haunting version of the Adler-Ross show tune of the same name, and makes us wonder if we are seeing the so-called real person or a trace element, fleeting in time. TIM DOUD’S “Blue” is comprised of thirty 30 by 22 inch self-portraits painted over a four-year period and hung in a grid. The artist strikes a similar pose and wears a series of blue shirts and eyewear acquired for the sole purpose of being painted. “The serial portrait interests me because time and other factors make each portrait different. Each of these portraits represents – and misrepresents – at the same time,” says the artist. JENNY DUBNAU paints realistic portraits using photographs as references – and in doing so, explores the relationship between photography and the realist tradition in portraiture. Her portraits and self-portraits capture the kind of enigmatic facial expressions particular to photography that may or may not belie the subject’s real feelings or actual circumstances. DONNA FESTA makes tiny, remarkable oil paintings and sculptures of old people. “These are narratives,” the artist says. “Each painting is a story, an encounter, a race against time.” No specifics are needed, because the human condition is the story of everyone. The paintings are as much about capturing the nature of the subjects, as they are about showing the expressive nature of paint. 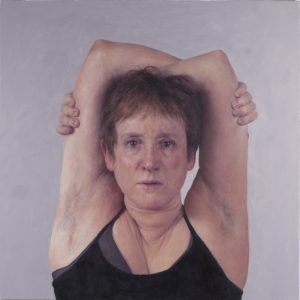 JOHN MITCHELL’S self portrait, the artist’s single work in the show, declares a strong sense of the physical presence of the artist. Infused with his commanding knowledge of the history of art and art making through the ages, the self-portrait embodies the influence of the masters. HEATHER MORGAN’S restless brushwork underscores a raw, live-wire intensity in her cinematically -styled portraits and self-portraits. “Beauty quivers with pain and flaw,” says the artist. JULIA SCHWARTZ is a self-taught artist comfortable with the doubt and uncertainty of working without a formal technique. Colorful, abstract figures “slip in and out” of her paintings, hinting at surrealist practices and darker psychological states. The exhibition will be on view January 19 – March 24, 2018 with an opening reception on Friday January 19, 6:30 – 8:00 pm. « EXCITING, AFFORDABLE, FUN! STUDIO CAFÉ IS BACK NOV.4! This entry was posted in Press Releases and tagged art, exhibit, painting, Portraiture. Bookmark the permalink.